- warp threads stretched on the loom and coming from the roller. These threads are laid out lengthways (warping). - the coloured weft threads crossing the warps with the help of the shuttle. These weft threads are laid out crossways (weaving). 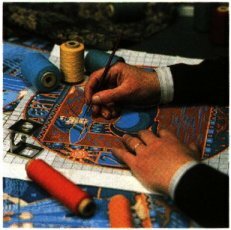 Two techniques exist in the manufacture of the tapestries: the "Haute-lisse" and the "Basse-lisse". These two techniques are radically different. However, once the work completed, it is often impossible to recognize the difference between them. 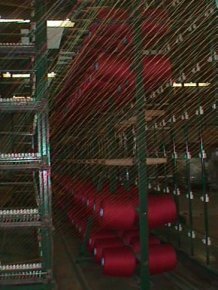 The Haute-Lisse loom is composed of two pillars supporting two mobile cylinders (rollers), the first one placed in the higher part, and the other in the lower part. Weaving is thus made vertically. 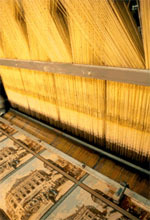 With the Basse-Lisse loom, the warp is stretched on a horizontal plan, thus weaving is made horizontally. The manufacture of a tapestry can be analysed in four stages. In order to guarantee a high quality product, the whole of the staff must be intransigent on the quality of the services carried out. One mistake can jeopardise the final result of the tapestry. These are the four stages of the manufacture of the Jacquard tapestries. Creation : The first work is the creation. 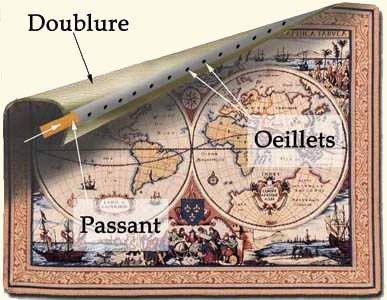 This work consists in the "mise en carte" the detailed drawing of the motif. Indeed, working from a medieval or contemporary design, the creator has to transcribe the colours and contours for the weaving. Which will be possible only after this work of " mise en carte". Production starts in the warping workshop. It is the weaving preparation. Thousands of dyed threads are winded on enormous reels (called rollers). These threads will form the warp of the tapestry. Thus, the warper arranges the various coloured threads, side by side, in a set order. Surrounded by a multitude of reels, the first foreman, whose eye is riveted on his machine, knows each thread and allots it to its place according to the motif. It is a work of patience on which depends the result of the tapestry. Looms Jacquard weaving : The weaver is tending the looms, in order to locate the possible defects. The warp and the weft will interlace each other, and the design will take life. All the tapestries offered on this site are finished according to your requirements. The tapestries are finished, ready to be hanged on your wall. - Most of our tapestries have an added border which is woven independently. This finition brings a decorative aspect which emphasizes the panel. - All the tapestries are lined with a beautiful cotton fabric. - A rod-pocket, hanging system, is put on the tapestry's back. the eyelets allow to hang your tapestries by using nails' head (insert nails in the wall, then hang nails' head on the eyelets). the rod-pocket allows to slide a rod which will be fixed into the wall, on each side of the tapestry.